In Bangladesh child death toll due to drowning is over 18,000 a year (BHIS 2005). To prevent child drowning CIPRB designed survival swimming teaching program “SwimSafe” in 2005 with the support of RLSSA, TASC and Bangladesh Swimming Federation. Since 2006 for SwimSafe program UNICEF, Save the children, Plan International, RLSSA has been providing financial support. In the beginning of SwimSafe program all instructors received a session in managing drowning causalities as a part of basic training. In 2012 beside basic training “First responder” training was incorporated as a part of SwimSafe program. SwimSafe program adopted first responder program from International Drowning Research Centre (IDRCB). Manual and trainers support was also adopted from IDRC-B. The manual is easy with enough illustration and the training continues for 2 days. Manikins also use in the training during CPR skill practice. In the beginning of the First responder training all volunteers participate in a pre test. The training session ismore focused in both practical and theoretical session. Instructors must perform all skills and all successful instructors receive a certificate as recognition of receiving first responder training. With the support of Internationals Drowning Research Centre Bangladesh 6 trainers were developed under SwimSafe program. Later trainers conducted the training under the guidance of Program Manager in different districts of Bangladesh. A group of 15 Community Swimming Instructors receive training at a time. The male and female trainers conducted the training. Both male and female trainees received the training in the same venue. All volunteers provided a manual during the training sessions. Since 2012 under the SwimSafe program a total number of 2,379 Community Swimming Instructors received first responder training in 23 different districts of Bangladesh. The trained community First Responder provided services in the community. Following the training till the month December of the each year a report form was collected the volunteers. During 2012 and 2014 a total of 4,625 community people were provided first responder services. Services were mostly provided causalities with cut, burn, drowning, electrocution, poisoning and animal bite. 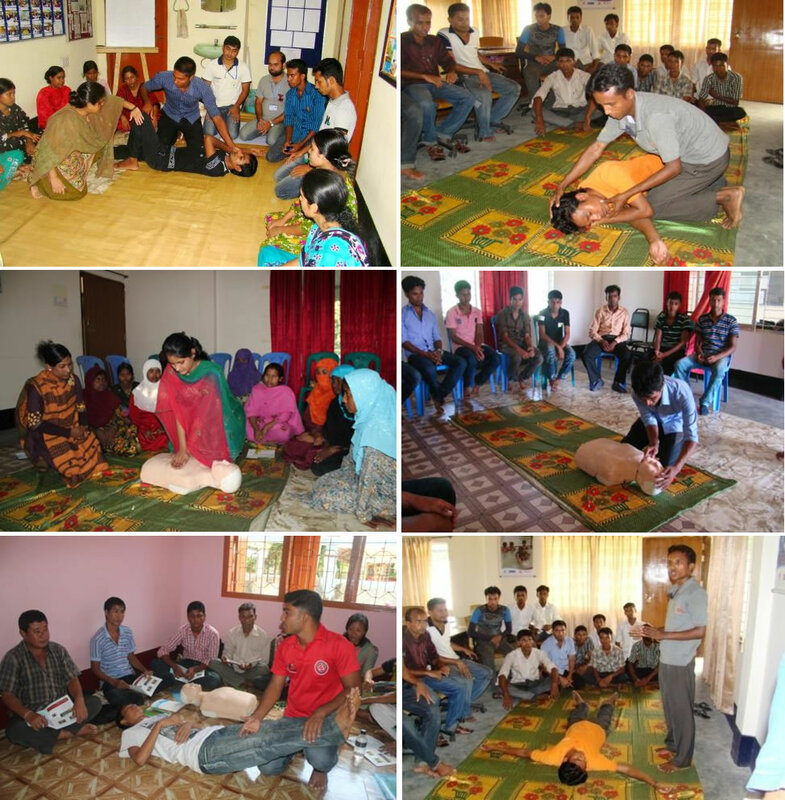 First responder program was incorporated as a part of “SwimSafe” program to provide first responder services was incorporated for managing injury causalities especially drowning causalities in emergency situation in Bangladesh. The instructors were adolescent so they successfully received the training and potentially provided first responder services in the community. Bangladesh is a disaster prone country so developing volunteers based community first responder it is possible to minimize the consequences of mortality, morbidity and disability in Bangladesh during disaster.